The Fort Street facade and the Quadra brick are fine for me. the quadra white is a big fail. Looks like a cross between the side profile of a cruise ship and, yes, a Super 8. Massing seems reasonable to me. Edited by manuel, 29 March 2017 - 11:20 AM. ...Massing seems reasonable to me. I would like to see more height at the Fort-Quadra corner with reduced massing along the "railing" portion of Quadra. Okay, revised impressions. From the Fort & Quadra angle it looks more massive but the overall effect is much different and I think much better, too. Suddenly I don't mind the white section with the long balconies along Quadra nearly so much (even though the balconies themselves are still very long and they still appear to be very ordinary even close up). The juxtaposition of the white section with the brick section on Fort actually makes for a decent impression from this side. Depending on what the cladding is on the white part it could seem slick and modern instead of bland and motel-ish. The curved corner & the tall/glassy ground level help the white section a lot. If it seems like a modern modular addition against the main brick building then I think the white section would work. If it seems like a bland motel wing then obviously that wouldn't be good. I give them points for the ground floor pretty much all around. That shorter section further up on Fort is welcome for introducing variation in the frontage & hopefully in the appearance of the ground floor, too. The upper floors along Fort might be treading into the realm of "too much flat & monotonous brick", but they've added some white elements here and there to break it up a bit. Conclusion: Distinguished ground floor & lower floors, a setback on the top floor of the brick section, different impressions from different angles... these things are all good. In terms of making a first impression, the Broughton corner was the worst view to show. The levels above the ground floor on the Broughton corner need something. And it still seems like the long balconies along Quadra are too ordinary. But otherwise I'm feeling much better about it. Edited by aastra, 29 March 2017 - 11:46 AM. I pretty much agree with everything you said aastra. My concerns now are mostly about those horrible motel balconies on the Quadra facade. Rework this section and perhaps introduce a bit more variation to the brick facade on Fort and the overall project will be quite decent. They are just watching all those vultures circling waiting for the old people to die. I think the materials look good, but the massing is bad. I'd do like 18 floors on the corner of Fort / Quadra and down to 6 floors on Broughton. 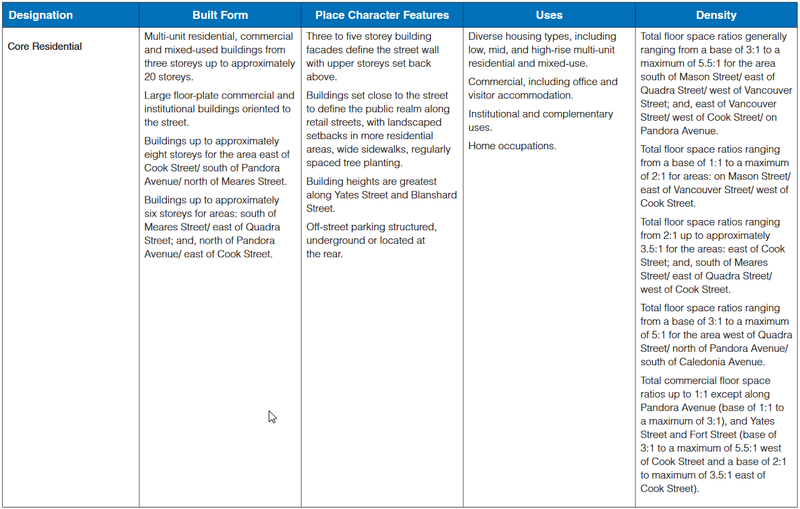 ...I'd do like 18 floors on the corner of Fort / Quadra and down to 6 floors on Broughton. 16. 17. 19. Whatever. Just not a 10 floor box. I guess my point is, what are the odds of getting anything over 10 floors approved? It would be very difficult to secure anything above 10-storeys on that block, I believe. For no legitimate reason and so we end up with a 10-storey wall along 2 major arteries. Brilliant. I believe the southwest corner of the intersection, or the northeast corner of that block, falls under the Cathedral District jurisdiction which limits buildings to 10-storeys. I must be missing something then, because according to the map it's Core Residential. 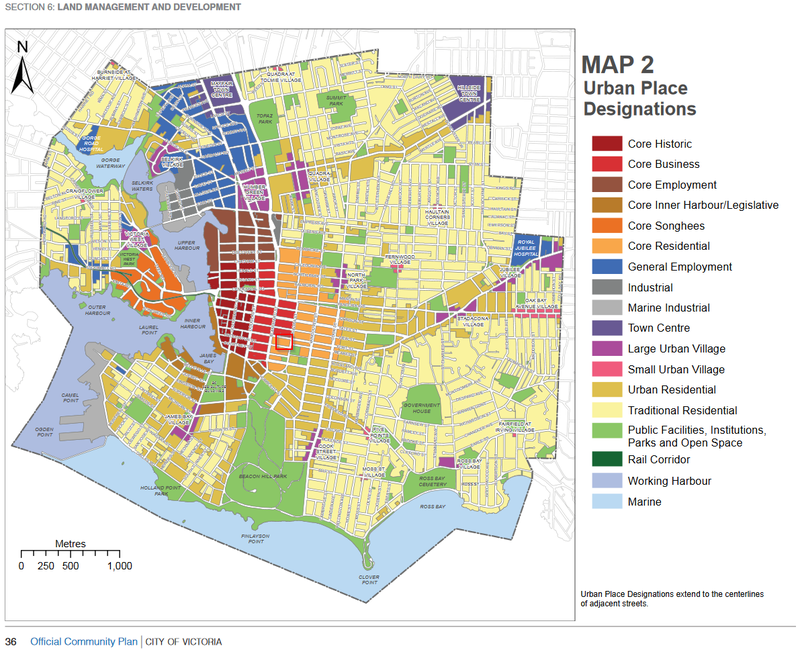 Yeah, I think the Cathedral District Precinct Plan overrides whatever other designation there may be. And the land is actually within Fairfield, not downtown Victoria or Harris Green -- just to complicate things further. Which is absurd since the Cathedral cannot currently be seen from Fort Street over the existing 3 storey buildings. I am not sure who came up with the idea that 10 storeys protects the view, but more than this obliterates it. I am told the Fort St. side is being reconsidered so it may look different than it does in the renderings above. Or has that been mentioned already? 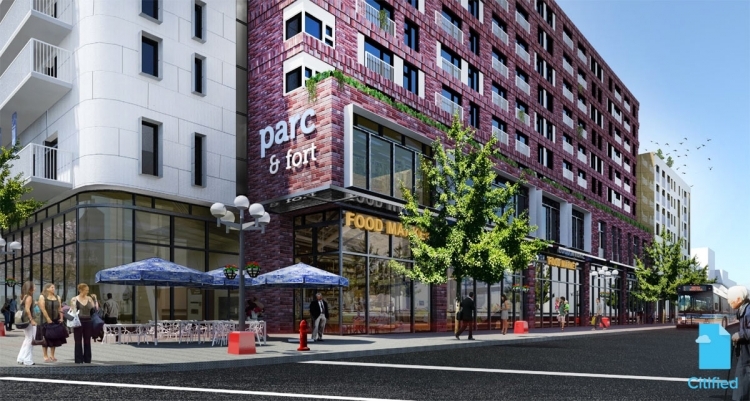 Hopefully, there will be no duplication of the Quadra Street facade on Fort! The Fort Street side looks good so I suppose we should expect some arbitrary changes there. I really hope they don't muck up the ground floor and second floor along Fort and at the corner. To my eye those two levels seem to capture the "downtown neighbourhood" feel that Fort Street is all about (the same feel that I worry "Black & White" might bungle).